1. For the dressing place all the ingredients into a blender and blend until smooth. The seeds will be finely chopped. 2. Fry the rice in a dry frying pan until they start to pop and turn a light golden. 4. Wash and dry the lettuce and break into pieces. Place on a platter. 5. Peel and slice the papino-papaya. Peel and slice the avocado. 6. Arange the papino-papaya and the avocado on the lettuce. 7. Just before serving pour over the dressing and sprinkle over the rice. 1. Add the brown sugar to a frying pan and melt the sugar. 2. Add the pecans and coat throughly in the melted sugar. 3. Remove from the pan and place on a greased baking tray with foil. 4. Sprinkle with cinnamon and set aside to cool. 2. Peel and quarter the beets. 3. Peel and cut the onion into wedges. 4. In one bowl, toss the beets with olive oil, salt and pepper and spread on a baking sheet. 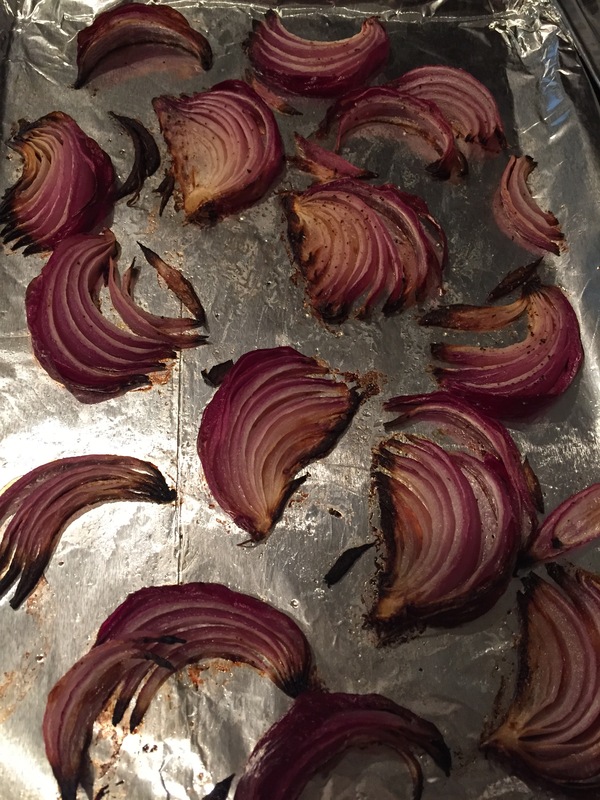 5.In a seperate bowl do the same to the onion but also add a few splashes of balsamic vinegar and spread on a baking sheet. 6. Bake for 30 mins turning halfway. 1. In a medium bowl toss the rocket with balsamic vinegar and place on a serving dish. 2. Over the rocket, add the golden beets and the caramalized onion. 3. 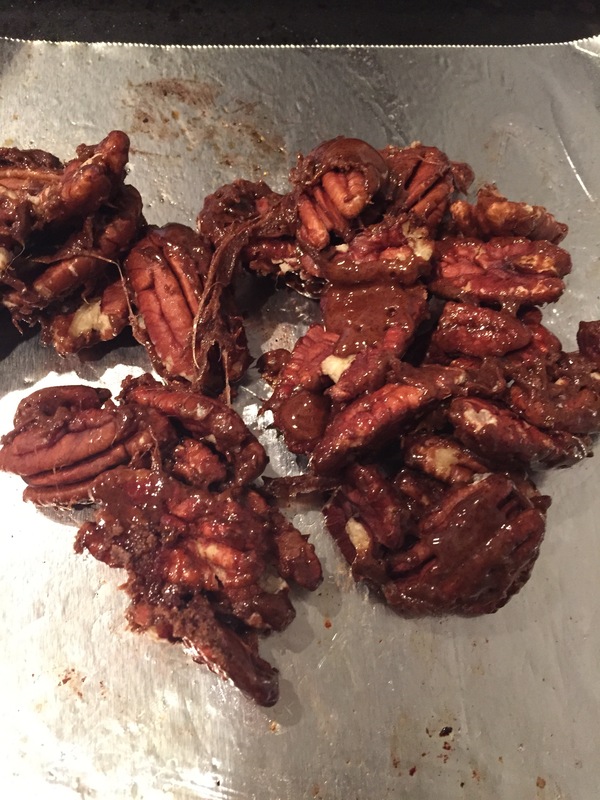 Break up the candied pecans and scatter on top. 4. 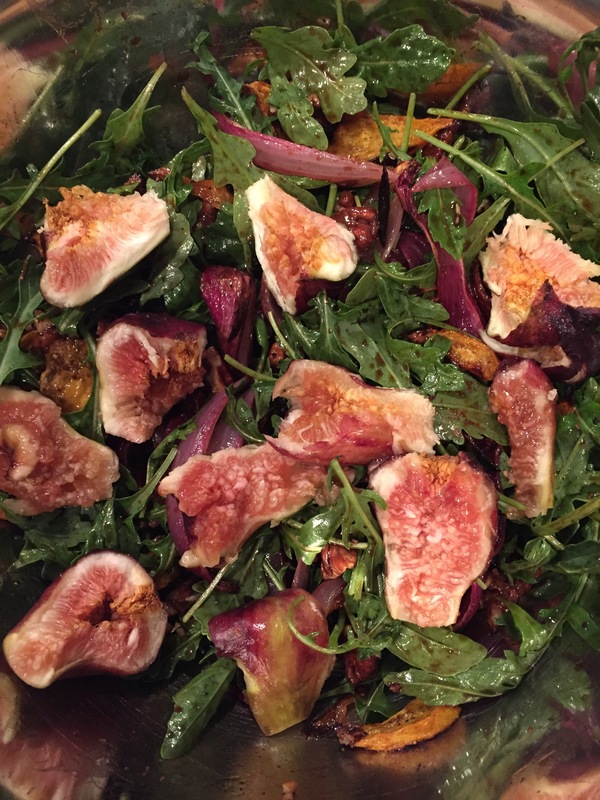 Tear or quater the figs and place on top. 5. If desired, drizzle with additional olive oil and balsamic vinegar to serve. 1. Place in the dressing ingredients into a blender and blend. 2. Boil the noodles until cooked, Drain and allow to cool. 4. Pour over the dressing and mix well. 5. Place on a serving platter and sprinkle on sesame seeds and finely sliced chives. Love the combination of fresh salad with mint & parsley and a lemon dressing. Add sumac to bring it up to another level. Sumac is a spice available from a Mediterranean deli. 1. Wash lettuce and dry. Slice into 1/2 inch (1cm) slices. 2. Slice tomatoes in half. 3. Slice radish in half and then slice thinly. 4. Cube cucumber and slice celery. 5. Wash and dry parsley & mint. Remove stems and chop. 6. Place lettuce, tomatoes, radish, cucumber, parsley & mint and peas in a salad bowl. 7. Toast pita, split open and slice into wedges. 8. 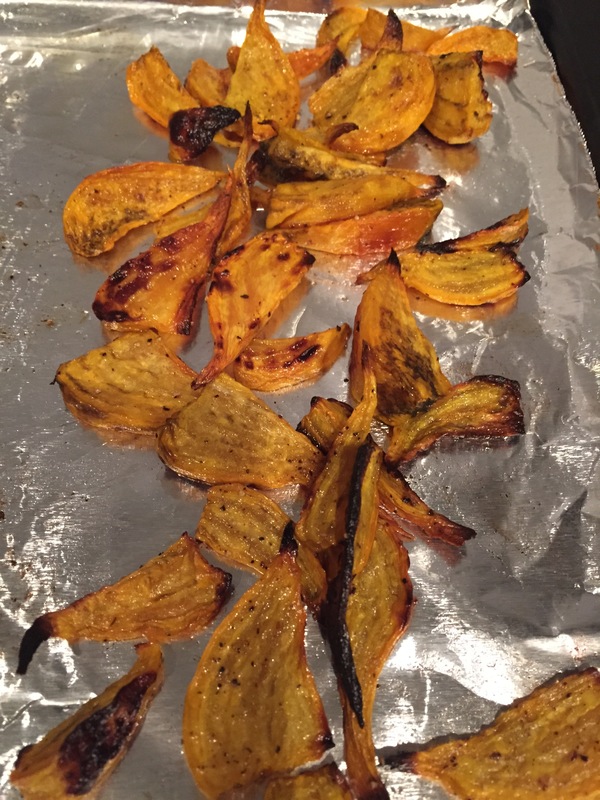 In a large frying pan heat olive oil and add pita chips with sumac, salt and pepper and toss till golden. Remove from heat and drain on absorbant paper. 9. Make dresssing by mixing lemon juice, olive oil, sumac, salt & pepper together till blended. 10. Just before serving add pita chips and dressing and mix through. 1. Cook cracked wheat according to packet instructions adding 1/2 tsp vegetable stock. Drain if any liquid left and spread out on a plate to cool. 2. Rinse lentils well. I use brown lentils or puy lentils. Cook in boiling salted water for about 25 minutes till lentils are tender. Rinse under cold water. 4. Toast pine nuts or pecans in a dry frying pan till light golden. Set aside with pepitas. 5 Mix dressing ingrdients together. Combine cracked wheat and lentils. Finely chop the red onion and add. Add raisins/currants. Pour over the dressing and toss well. Taste and ajust seasoning. 6. Spread onto a large platter snd sprinkle over the nuts & seeds. 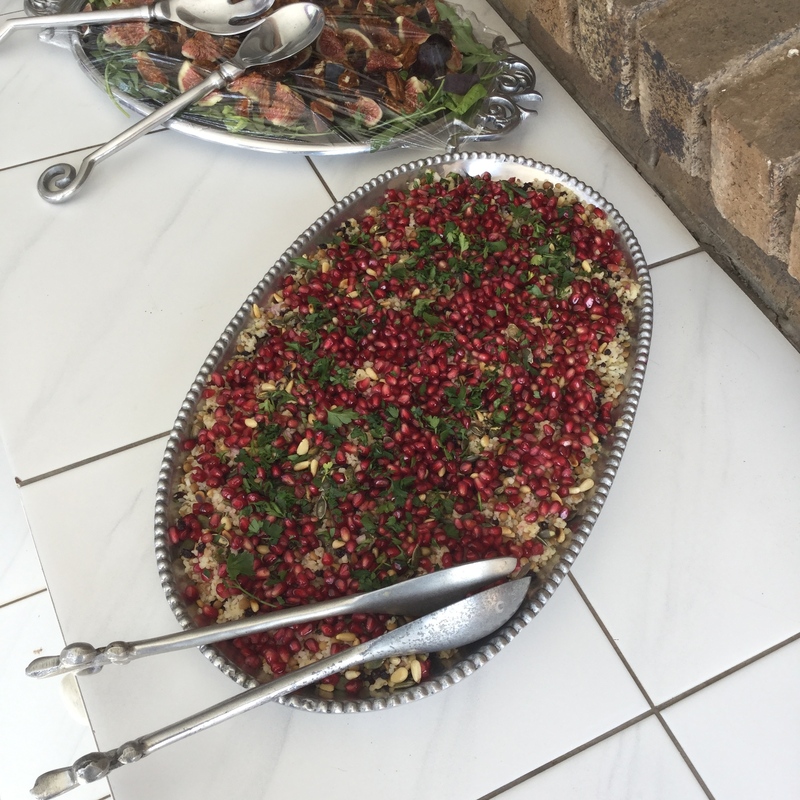 7. sprinkle over the pomegranate seeds and parley and serve. This is delicious served with crisp flat bread or focaccia and white wine in the summer. Due to it being marinated it will keeps for ages in the refrigerator. 1. Place all ingredients into a large rectangular plastic container with a lid. 2. Pour over the dressing. 3. Leave to marinade for a few days. 4. Decorate with fresh basil and pecan nuts before serving. 200 grams Smoked Salmon – Thinly sliced and cut into strips. 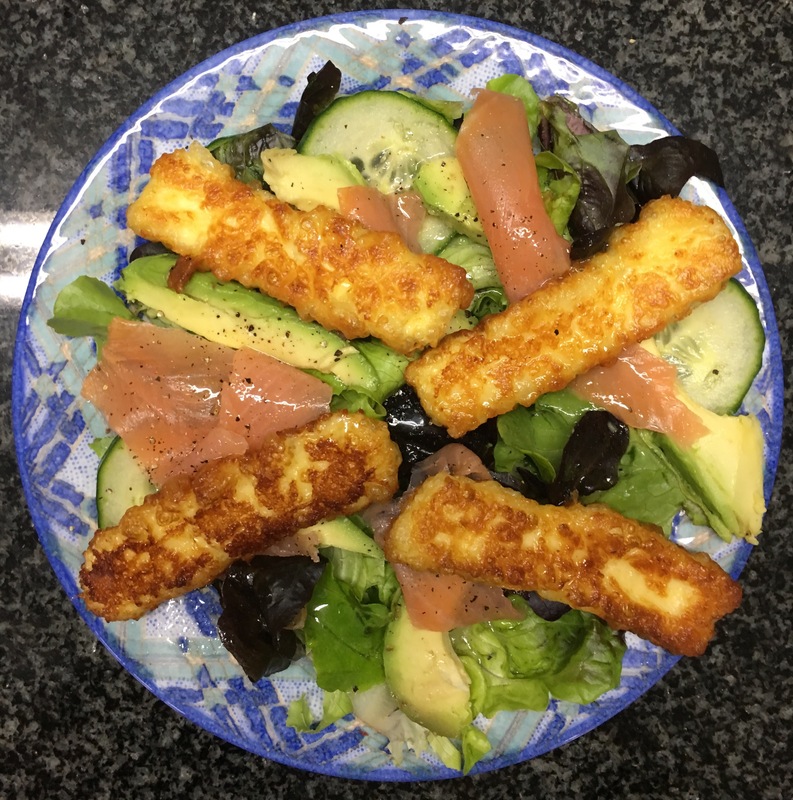 Make 1½ cups of sushi rice at least a few hours before making the salad (best if it is made the day before) and leave it at room temperature. Spread prepared rice over a large platter. Cover with shredded carrots, cucumber and salmon. Mix all the dressing ingredients together in a bowl. Pour over the salad and lay the avocado slices around the salad. Add some pickled ginger and sprinkle with chopped spring onion and toasted sesame seeds. Bring rice, water and saki/white wine to the boil and let simmer for 15 minutes. Turn heat off and steam for 10 minutes. Draw a spatula through the rice to mix. Cover with a dish towel under the lid of the pot to absorb moisture. Now transfer to a wooden bowl. 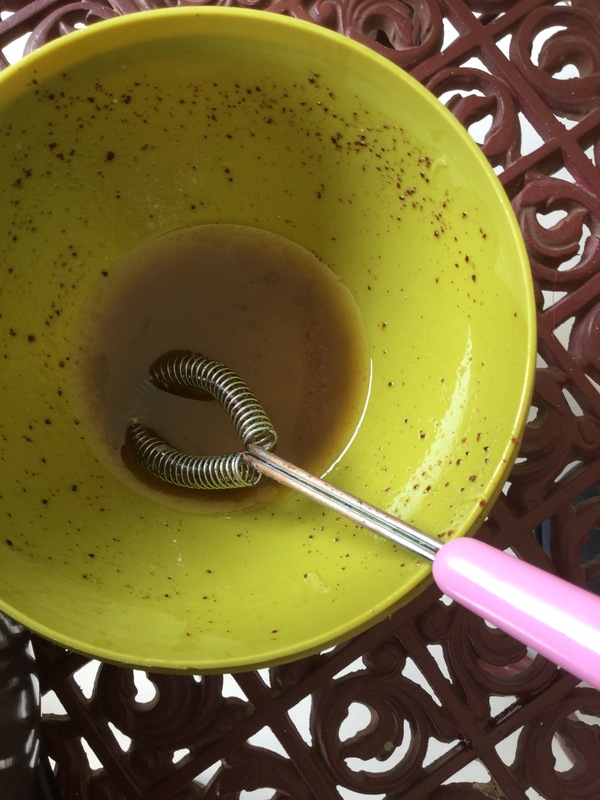 Mix seasoning – Rice vinegar, sugar and salt together and gently pour over cooked rice and mix well. Fan the rice mixture while it cools and mix gently. Lay lettuce leaves on a platter. Quarter apples and remove the core but leave skin on. Thinly slice the apples. Sprinkle with lemon juice. Thinly slice apricots and figs and cucumber. Place apples, figs, apricots, cucumber, cheese and pecans on top of lettuce leaves. Combine all ingredients for the salad dressing in a small bowl and mix. Pour dressing over salad just before serving.